They call it the Sunflower Revolution. Last Tuesday, scores of university students stormed into the legislature in Taipei and took over the premises. Their grievance? Kuomintang (國民黨), the country’s ruling party, tried to ratify a controversial trade agreement with Mainland China without proper review by lawmakers. A few days later, a smaller group raided the cabinet building but were later removed by riot police. In all, over 10,000 people participated in the largest student-led protest in the country’s 65-year history. Things are relatively tame in the second largest city Kaohsiung. Around 200 people — students, taxi drivers, store owners and office workers — congregated outside Kuomintang’s local office on Jianguo First Road (建國一路). That’s where my brothers and I found ourselves this Sunday. We took pictures with our big cameras and chanted slogans with the crowd. The organizers spotted us and invited their “supporters from Hong Kong” to say a few words on stage. We thanked them for asking but politely declined. We told them our Mandarin isn’t very good. In truth, we didn’t know enough about the trade pact to say anything intelligent. As it turned out, neither do most people in Taiwan. False rumors about the trade pact abound. 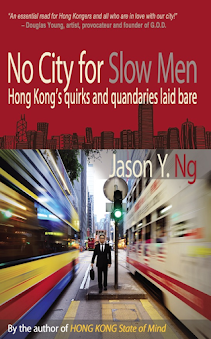 The fear that Mainlanders will be allowed to buy their way into Taiwan, for instance, turned out to be misplaced. The agreement does not confer either citizenship or permanent residency. It all goes to show how little public discussion — and proper consultation — there has been over the agreement, which takes us back to what triggered the student protest in the first place: the government’s unilateral move to push through a contentious bill without a line-by-line review. So what’s this agreement and what’s in it? Formally known as the Cross-Strait Service Trade Agreement (CSSTA, 服貿), the pact was signed in Shanghai in June 2013. It is one of two major sequels (the other one being the not-yet-signed “Agreement on Trade in Goods”) to the high-level, largely symbolic Economic Cooperation Framework Agreement (ECFA, 兩岸經濟協議) inked in 2010. CSSTA is all about opening up the service industry in both countries. It aims at creating cross-strait investment opportunities in dozens of service-related sectors (64 in Taiwan and 80 in China), such as banking, healthcare, tourism, films and telecommunications. Among other things, CSSTA will allow qualified professionals in Mainland China to apply for short-term (three-year) visas to work in Taiwan, and vice versa. Mainland corporations, such as banks and mobile service providers, will be able to set up branches and offices in Taiwan or purchase stakes in Taiwanese companies within the permitted industries, and vice versa. CSSTA is long on commitments but short on details. Exactly how many visas will be issued each year and what level of foreign investment is permitted will be the subject of further negotiations. Implementation is to be monitored and specifics are to be worked out in the years to come. So while CSSTA is a meatier follow-up to ECFA, there is still a way to go before the rubber actually hits the road. 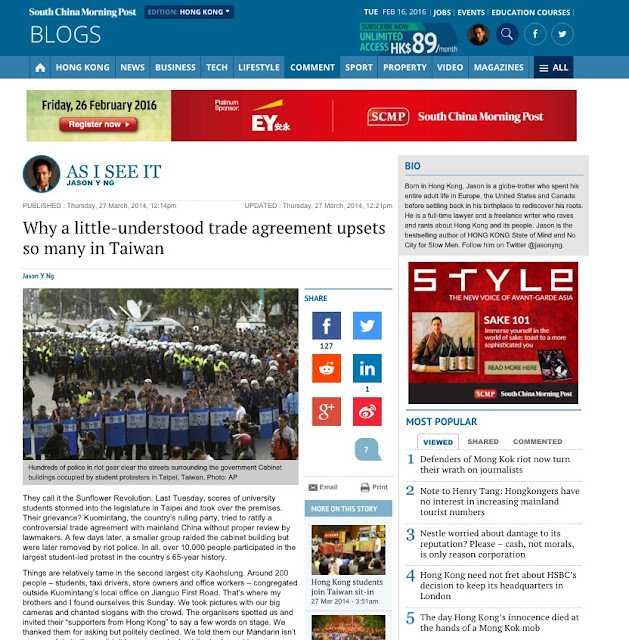 Neither the lack of understanding nor the lack of details about the trade pact, however, has stopped people from condemning it. It is so for two reasons. First, the public is offended by not so much what is in the agreement as the way their government has tried to pull a fast one on them. 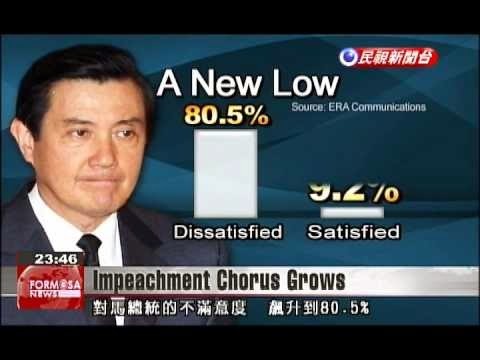 President Ma Ying-jeou’s (馬英九) attempt to slip the bill under the radar screen is just another confirmation that he is more concerned about salvaging his tattered legacy than looking out for his country. CSSTA was intended to be the stone that kills two political birds: on the one hand, it is a step closer to the economic integration that the China-friendly Ma has been engineering. On the other hand, it is a badly needed jolt to the languishing economy for which he is blamed. But everything has now backfired. The Sunflower Revolution has not only turned back the clock on cross-strait relations, but also taken a further toll on Ma’s dwindling popularity. His approval rating has been hovering at a pitiful 9%, the lowest among leaders in the developed world. The second reason has to do with the natural suspicion of a unification-obsessed China. Many Taiwanese view ECFA and CSSTA as baby steps in Beijing’s quiet, carefully planned annexation of the renegade island. Bit by bit, Mainland Chinese companies backed by the Communist machine (to whom money is no object) will buy up Taiwanese assets and put the country’s economy and national security at risk. The dubious benefits of a hastily-drafted trade agreement are far too high a price to pay for the country’s autonomy. And people don’t need to look far. This kind of creeping economic imperialism is already happening to their cousins in Hong Kong, where signs of gradual Sinofication are everywhere. Before they know it, Hong Kong — and Taiwan for that matter — will become the next Crimea. There is no telling how much longer the student protesters will stay, or be allowed to stay, in the legislature. 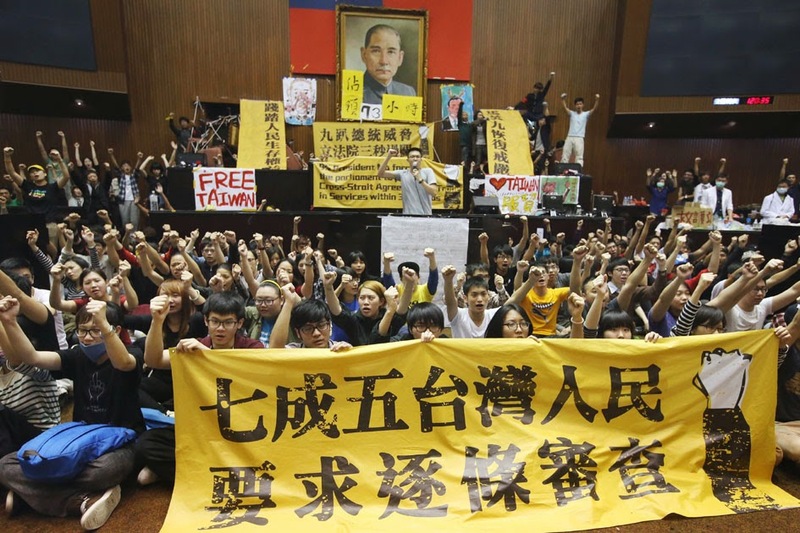 Two days ago, Ma Ying-jeou agreed to hold talks with student leaders to try to end the standoff. One proposal is to set up a mechanism for the legislature to scrutinize the implementation of CSSTA and future trade agreements with Mainland China. Whatever the outcome is, the saga has been the best thing that happened to the Democratic Progressive Party (民進黨, the main opposition) since Chen Shui-bian (陳水扁) won the presidential election in 2000. 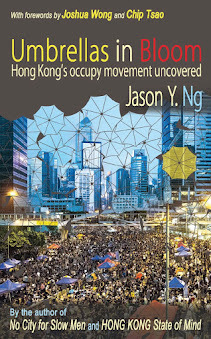 Here in Hong Kong, we watch the unfolding events in Taipei with interest and envy. With our own political crisis brewing over the 2017 chief executive election, we wonder if our university students will be as brave as their counterparts in Taipei. We wonder if sunflowers will ever bloom in Hong Kong. This article was published on SCMP.com under the title "Why a little-understood trade agreement upsets so many in Taiwan."